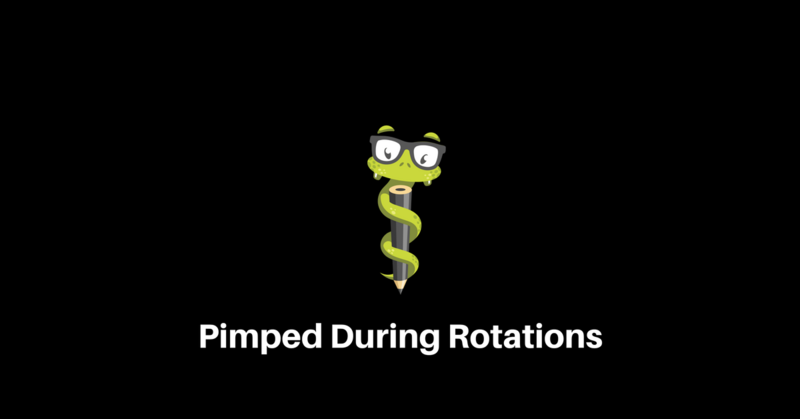 The act of “pimping” is very common for medical and PA students participating in rotations. Pimping is an age old term used to describe when a preceptor or mentor asks a question “off the cuff” to a student learner. Many students may be overwhelmed by questions, but pimping remains a way of teaching learning points and “pearls” encountered for various diseases processes. The concept of being on the spot can be intimidating for students. When I was a student, I can specifically recall a preceptor who always pimped me. It seems that with every patient, the preceptor could find some archaic “law of medicine” or complex question that left me stumped! Not knowing the answer to a question can be overwhelming and sometimes embarrassing. Especially in the setting of an encounter with attendings, physicians, other students, or residents on rounds. One piece of advice that I learned that has stayed with me is when pimped, to take a brief second to actually think and form an educated response. As a student, it can be easy to get into the mindsight of “I must know everything”. No one knows everything in medicine. The most experienced clinicians out there are still learning every day, as medicine is ALWAYS changing. It is also important not to get flustered. Pimping can be a traumatic experience, but being optimistic and willing to learn is essential. Some of the most important points I have learned along my journey come from listening to the expertise of others. A good approach is to write down everything that you do not know from the day, research it, and be ready for the next question! It is important to remember that we have all been there. Everyone goes through a similar journey, whether it is PA school, NP school, or medical school. The student’s role is to learn! With that in mind, today’s article will be a clinical review of a commonly encountered complaint: carpal tunnel syndrome. We will review a few key points and pearls so that when you encounter the disorder, you can be pimp prepared! Carpal tunnel syndrome, which will be referred to as CTS for the remainder of the article, is a very common diagnosis across primary care office, urgent cares, and orthopedic offices. The disorder is estimated to impact approximately 1 to 5% of the population at some point in their lives. This is more common in women, about 3 to 1 versus males. Risk factors for carpal tunnel syndrome are many. Obesity, diabetes mellitus, pregnancy, rheumatoid arthritis, hypothyroidism are all possible contributors. Aromatase inhibitor use has been associated with CTS. As elucidated in many patients’ histories, repetitive use of the wrists and hands is also a contributor. Patients who are using their wrists/hands frequently, such as typing, texting, are risk factors. Repetitive motion may contribute. The history in patients presenting with CTS symptoms is usually straight forward. Patients will complain of pain in the wrist, hand, usually along the median nerve distribution. This encompasses the first three fingers and the 1st half of the ring finger. There will also be paresthesias, numbness and tingling along the region. Patients may classically complain that the pain is worse at night. Patients may have bilateral involvement or may have impact only in the hand that they are frequently using. Reading, typing, holding objects may make this worse. Patients may give a history of repetitive work, such as frequent text messaging, typing, or repetitive factory work. Some patients with severe and progressive CTS may also complain of significant weakness in the hands, loss of grip strength. Some patients may have trouble gripping objects such as the morning coffee, buttoning a shirt, or opening a door may be problematic as well. The examination in CTS provides many possible pimping questions. In CTS, it is very important to perform a comprehensive and thorough neuromuscular exam. Strength of arm flexion, extension, wrist flexion/extension, finger abduction/adduction/flexion and extension should be documented, along with grip strength. Phalen’s test is a test that is very sensitive and specific for CTS. The patient flexes the palms and places the back of the hands together. This position is held for 30 to 60 seconds. Patients with a positive test will have pain and paresthesia in the median nerve distribution. A quickly positive test indicates more severe disease. The Tinel test, or tap test is performed by having the patient hold out their wrist/hand and the examiner taps along the median nerve distribution. Pain and paresthesia with tapping is a positive test. Diagnosis is largely clinical, but in the rare setting where the diagnosis is unclear or other etiology is suspected, an MRI can be attained to rule out mass lesion causing similar symptoms. The differential diagnosis includes fibromyalgia, median neuropathy, osteoarthritis, rheumatoid arthritis, or cervical radiculopathy. Once the diagnosis is established, the management begins with conservative therapy. NSAIDs, Tylenol are mainstays. Rest is an important aspect of the treatment, but may be difficult if the patient is working in a repetitive job setting. Another first line treatment is using a brace that puts the wrist in a neutral position. This can be worn during working time, but is most beneficial at night. A short course of oral glucocorticoids in a tapered fashion may be helpful. For patients that fail conservative therapy, physical therapy or occupational therapy consult may be warranted. In patients whom all else fails, carpal tunnel release/decompression may be a last option. Risks and benefits to the procedure should be explained to the patient. As discussed above, pimping is a common practice in medical education. For students climbing the medical education ladder, this can be very daunting. Staying calm and thinking on the spot are skills that can be learned. Carpal tunnel syndrome is a commonly encountered clinical problem with many pimping points. Kothari, Milind (2018). Carpal Tunnel Syndrome: Clinical Manifestations. UpToDate. Date of Access 12 April 2018.